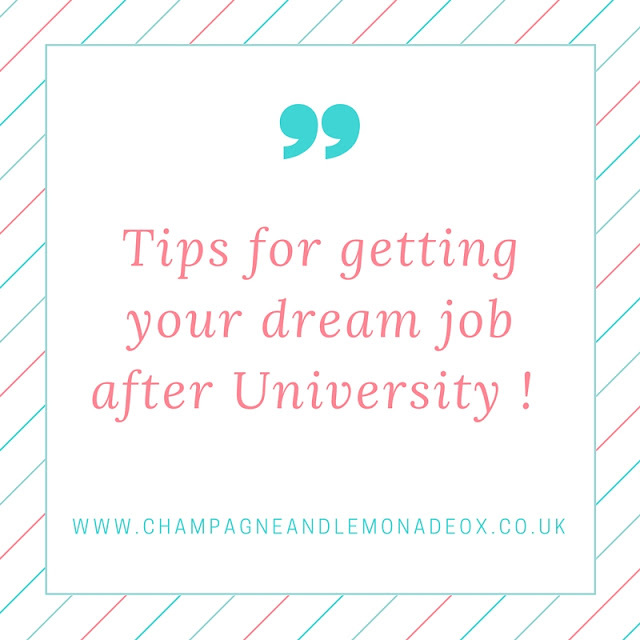 You may have seen my recent post all about student essentials, tips and tricks about what to take to uni. So I thought to go along with that I would write up what I have been up to one year on and how I have achieved my goal of working in PR. I find posts like this really helpful, especially when I was researching jobs and what I needed to have to be able to progress within my career. So I thought I would write up a few key tips as to how to achieve that dream job. 1. Decide early on what you want to do. Obviously this is hard but if you have an idea of what career path you would like to take it will be a hell of a lot easier. I decided I wanted to work in fashion when I was around 14/15 I choose my GCSE's based on this then my A Levels. I then knew I wanted to attend London College of Fashion so I did everything I could to get in. I studied there for a year to decide which area of fashion was for me which then confirmed my university choice of International Fashion Marketing. 2. Get involved with appropriate activities. You want to be a footballer you join a team right! So if you want to be a Journalist you start a blog, you want to work for the radio you volunteer at festivals or you want to be a chef you start working in a kitchen and so on. There is always something you can do to help build up experience. I have my blog obviously but I also try to get involved with things such as Fashion week and attend events such as Graduate fashion week (before I even went to university) You could even help out at your school, I became a peer mentor at school, I completed my JSLA award and helped out at Textiles club. These all helped me learn skills in working with younger children and managing responsibility too. This I feel is VITAL ! I managed to complete two work experience placements. I worked at a marketing agency and at a menswear brand. Both teaching me key skills about the industry and helped me gain valuable experience that has got me where I am today. These where both un paid however the experience was worth it. Especially in the fashion world i have seen there are tonnes of placements however if you see a company you would like to work with why not just give them a call and ask if you can gain experience be that one day or one month. Thats how I managed to work at the marketing agency which lead me to being involved with Hull fashion week. 4. Be the expert in your field. I think its really important to be on top of your game in the field you wish to work. Sign up to news letters and regularly check the right websites to make sure you know your stuff. I once had a call from a company and asked if I could interview over the phone there and then, the questions thrown at me would be a lot more difficult if I hadn't read up around the topic daily! This may sound a bit strange but once you are let loose in the big wide world after university it may be pretty difficult to find a job that you love straight away. I started looking before I graduated and applied for loadssss but only ended up having two interviews. The first one wasnt great and I wouldn't have gone back even if they asked me however the second actually called me after finding my cv online (yeah upload it to job sites and they may contact you!). the job sounded interesting although not really related however I went to the interview anyway, really liked the company and people and was offered the job 20 minutes after leaving! This job thought me more than I thought and led me on to gaining more valuable experience I needed to land the job I am in now. Deciding what you want to do for the rest of your life is not easy and getting there is even harder, but you just have to remember that if you work hard you will get there. As long as you put in the hard work you'll be sure to land your perfect role! This post was in collaboration with Spotlight Recruitment, a marketing recruitment agency. You can upload your CV to their site and browse there huge range of marketing roles.